For Symbid, the opening of the ECE was a major event because this festive, official start also was the kick-off of Symbid's own campaign. On Saturday, March 1st, Dutch Prime Minister Mark Rutte, opened our new headquarters and kicked off “Symbid on Symbid,” our own crowdfunding campaign conducted on our own crowdfunding portal. It's now possible to be become co-owner of Symbid from as little as EUR 20. The response has been tremendous, and the campaign is now over 90%! Why should you invest? 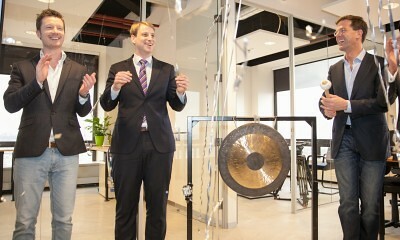 Symbid is aiming to expand in the Netherlands and internationally. That's why Symbid made the bold leap to the U.S. by going Public on the OTC:QB under the ticker symbol SBID. The OTC:QB is on the OTC QB,the segment of the Over The Counter market in the United States reserved for the highest quality companies. In the last three years, Symbid has grown from an idea to a valuation of USD 17 million. After an influx of requests, we’ve made makeit possible for the crowd to invest as well. As a result of your co-ownership via the cooperation, it'll be possible for you to profit from the exciting new developments Symbid is going through! There's no doubt that the opening of the ECE was a major success factor in Symbid's campaign!